Good evening, princesses! Here is a manicure that is sure to give you sweet dreams about polish. ;P I was fortunate enough to snag Once Upon A Starry Night during I♥NP's clearance sale, and found the limited edition Pure Ice color Fairy Godmother, which pairs wonderfully as a base color. Also, I think I may have found my "pose" for pictures. Holding my hand at an angle seems most comfortable. I used one coat of I♥NP (I Love Nail Polish - what a great brand name!) of Once Upon A Starry Night, which is a clear-based glitter with a really nice density for using as a topcoat. The glitters in it are prismatic, silver, blue, and matte white. It contains holographic silver stars but not very many of them. Getting one of the stars is a treat, and the nails without stars don't look like they are lacking. I've had this polish on my wishlist since I first saw it announced last year! Sadly this shade is now discontinued - sorry! ILNP definitely earns their tagline of "boutique nail lacquer": the super cute packaging, the wonderful brush and good formula... I'm not sure if this bottle is made with the original or reformulated glitter base. (The suspension base was changed after complaints that the polishes were great but smelled horrible.) I can say that this does have a polish smell but it is not at all offensive! 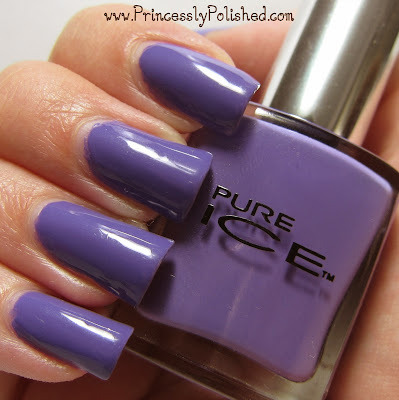 Pure Ice Fairy Godmother is a perfect amethyst shade that will. not. photograph. accurately. I tried color-correcting the photos and gave up, because by the time the polish was looking right my hands looked fiery. Yes, this is a cool-toned purple, but it is more red than this. It's a medium type of purple that isn't too bright, too dark, too pastel or dusty. It also seems to have a faint hidden shimmer. I used two coats, and coverage was very good. The formula is on the slightly thick side.